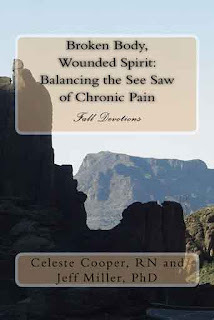 Read more reviews on the Fall Devotions of the Broken Body, Wounded Spirit: Balancing the See-Saw of Chronic Pain Series on Amazon here. Being forced to look at life through a peep hole is petrifying, and that is exactly what chronic pain and illness does. It isolates, dominates and threatens the things all human beings hold dear. They are bullies with a ravenous appetite for creating mayhem in one’s life. Anguishing physical and emotional pain is often overlooked. After all, “the person doesn’t look sick.” From the outside pain isn’t visible, but from the inside, it is an unwanted intruder to the person experienced it. It is a thief of goals and dreams, finances and social life. Finding balance and avoiding isolation when struggling with chronic pain is difficult. This book bursts from its’ bindings as a metaphoric tool to help the reader break free from pain’s shackles. The authors expose their readers to infinite possibilities of viewing life through a door open to a landscape of honor and hope, by using their expertise as RN, educator, and counseling psychologist, the authors guide their readers through the physical and mental chaos. It is rare to find a book that offers encouragement, practical advice, comfort and aesthetic appeal all at the same time. Fall Devotions of Broken Body, Wounded Spirit, like the rest in the series, offers all this – and more. The Kindle app is also available for PC, but I understand. Some things I like to read in paperback too. Your story is unfortunately not the first I have heard. I don't have CRPS, but a close personal friend does and another who has had 3 tick bites all carrying Lyme's, another poorly understood disorder, all with many complications physically, emotionally and surely socially. You have sure had a rough road, but know you are not alone. We must fight for awareness and balance in our own lives. Disease does not define our character, and you sure are a survivor. That said, we all, including myself, need reassurance and uplifting during the difficult times. That is why we have started this series. It was born of my own need to use what we wrote in the 434 page book (Integrative Therapies...)on an applicable daily basis. Here is where the Fall Devotions are available in paperback.